Our Lord Jesus Christ, King of the Universe – Solemnity - My Catholic Life! This last Sunday in Ordinary Time is dedicated to the very highest understanding of the nature, role, and purpose of Jesus of Nazareth. Jesus is multifaceted, the deep hues and contours of his personality revealing themselves to different races and ages in different ways. Even inside of just one single life, a Christian can understand Jesus in more subtle and complex ways as that Christian matures. Carpenter, Miracle Worker, Son of Mary, Son of God, Prophet, Messiah, Son of David, Good Shepherd, Healer, Preacher, Logos, Lamb of God, etc. Yet all these titles and identities will give way as the world ends, time is fulfilled, and life with God becomes simply life itself. Jesus’ identity will culminate in His Kingship. It will not be a transitional but a terminal identity. The dead will come nose to nose with King Jesus, feeling His hot breath on their cheeks, as He judges them at their life’s end. And the saved will have King Jesus before them in Heaven forever as He renders homage to God the Father in the power of God the Holy Spirit. 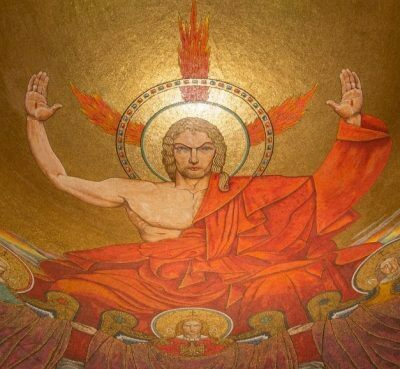 The feast of “Christ the King” was first established in 1925, and Pope Saint Paul VI expanded its name to “King of the Universe” in 1969. Jesus is not just a King of Hearts. He is more than a Universal Coach, Teacher, or Consoler of mankind. By “King of the Universe” the Church is communicating Jesus’ metaphysical scale, that God encompasses all of reality, not just man’s reality. We say in the Nicene Creed that God created all things visible and invisible. So Jesus is King over all the planets, stars, black holes, quasars, and exploding suns in the blackest corners of remote space. He is King over the earth and all its waterfalls, rainforests, mountain peaks, desert plains, and dark sea floors. He lords over all creation because He is its source. Saint Thomas Aquinas taught correctly when he wrote that God is not the most perfect being inside of creation but Being itself. God is reality, not just the most impressive being inhabiting the reality bubble. This feast is an antidote to the private, or compartmentalized, Jesus who impacts only those spaces in the Christian’s life where He is allowed to enter. Jesus wants to reign in every sphere of our lives, at home, on the factory floor, in the yard, at the office, over drinks, on the sports field, in the car, at meals, on the phone, and on and on. His field of action has no borders. From one perspective, this is a challenging, and limiting, spirituality. Such an intrusive, all-encompassing God can make life feel like a cage, where self-expression is constrained by His rules. From another perspective, however, the total reign of God in our lives is freeing. It means that He is not found only in Church. Sunday Mass? Of course. But we need not have our fingers on the rosary to be close to God and Mary at all times. God is found inside of the daily duties that are the stuff of life. This is consoling. We are not distracted from the higher things as we manage a family, earn a living, exercise, raise the kids, or take care of the house. When the Lord is King of Everything, mundanities are not banalities. The world is richer and more alive when our life is an all-inclusive vocation. Jesus reigns and we are His subjects. “We” means our souls, minds, consciences, goals, loves, work, desires, disappointments, and all that makes up our lives. We should be glad to be subject to such a benevolent Monarch. Christ the King, Your sovereignty over all creation is not heavy. You order all reality toward Yourself and govern Your creatures with justice and humility. Help us to be faithful and subservient to what You desire, so that we can live one day in Your heavenly kingdom.